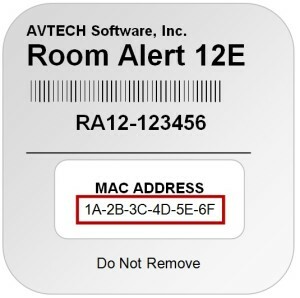 You may need the MAC address of your Room Alert Monitor to perform certain tasks, such as advanced discovery in Device ManageR or Device Discovery. 1. 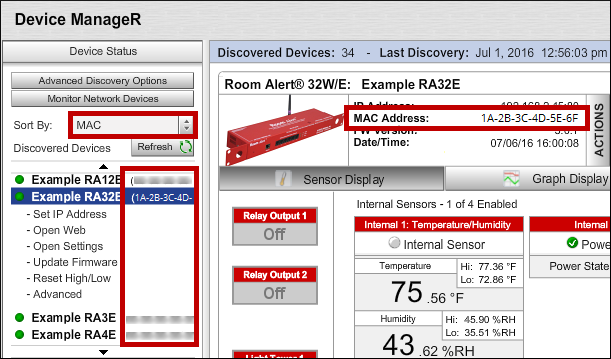 Open your Room Alert Monitor’s web interface. 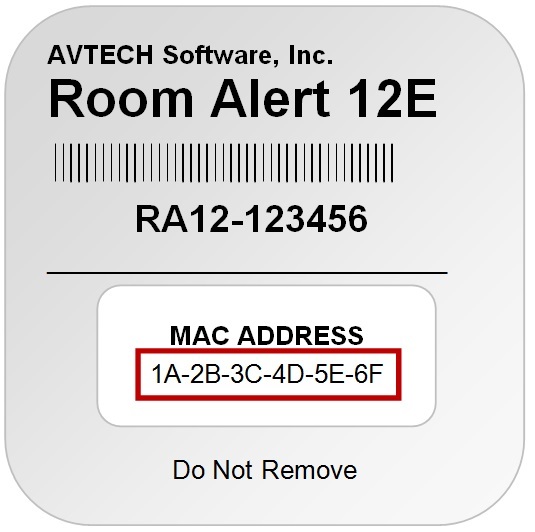 You may open the interface using Device Discovery, Device ManageR or your account at RoomAlert.com. You may also type the IP address of the unit directly into the address bar of your web browser. 2. You’ll see the MAC address displayed in the Status page. 1. Log in to your account at RoomAlert.com. 2. Select Devices from the navigation bar to the left. 3. You’ll see the Inventory tab, where you may find the MAC Address of each of your devices in the Identifier column. 4. You may also select a device from the Inventory list to view the MAC address on the left side of the Device Details page. 1. Open Device ManageR in your browser. You may open it by entering ‘localhost:8080’ or ‘<IP address of host system>:8080’ in your browser’s address bar. 2. Select Device Status in the navigation bar to the left of the screen. 3. A list of discovered devices appears, which you can choose to sort by MAC address. Next to each device name, the MAC address appears. 4. You may also select a unit from the list to see the MAC address in the main viewing pane to the right. 1. Open AVTECH Device Discovery. You may find it in your Windows system typically through the default path, C:\Program Files\AVTECH Device Discovery Utility or C:\Program Files (x86)\AVTECH Device Discovery Utility. 2. Select Search to bring up a list of discovered devices. 3. You’ll see the firmware version of all units in the third column under MAC Address.